Home > Cases > T.T.S. TAC Force™ T.T.S. Discreet Soft Gun Cases have a proven track record of durability and quality used by law enforcement and military personnel. Each case is manufactured using 900 Denier materials, high-quality components; heavy duty stitching plus our material is treated with DuPont® Teflon® to ensure product durability and longevity. Several size lengths to accommodate today’s modern firepower plus accessories with ease and total protection. 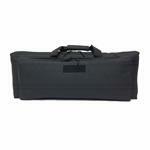 Each case has a secondary compartment to stow additional magazine pouches, handgun or gear. Each T.T.S. case comes equipped with a removable AR magazine pouch, shoulder strap and pistol sleeve.